For rapid on-site calibration of transducers, transmitters, gages, and many other pressure-sensitive devices, OMEGA ® PCL-5000 Series calibrators provide high accuracy, reliability, and automatic pushbutton operation. 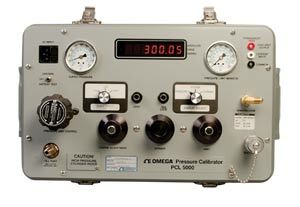 OMEGA’s PCL-5000 portable, precision pressure calibrator is designed for the higher pressure range calibrations (20 to 2000 psi) and has its own self-contained 2000 psi nitrogen cylinder. It also provides push-button operation and switch selectable calibration modes for absolute or gagepressure. An extremely accurate instrument (±0.05% FS), the PCL-5000 comes complete with quick disconnect fittings and hoses for input and output pressure. The PCL-5100, a low-pressure unit with ranges from 30 inHG to 100 psi, offers five independent selectable ranges. Specifically designed for rugged field usage, it weighs less than 25 pounds and has its own built-in pressure and vacuum source. 참고: All PCL5000 series calibrators come complete with NIST traceable calibration certificate, hoses, couplings and complete operators manual for immediate on-site use. For a second scale in inH2O on the PCL-5000D or PCL-5000DB add suffix "-2" for extra cost.